Numerous surveys have shown that Americans are concerned about being financially secure in old age. For most young adults there is fortunately still time left for them to make significant improvements to their overall level of retirement preparedness. These corrective changes, though, are less of an option for older Americans that have already left the workforce, and there are a few studies that help shed light on just how satisfied such individuals are with the retirements they have been able to achieve. For example, a Gallup survey found that only about half of working Americans expect to be able to live comfortably when they retire but 74 percent of the respondents that already retired report that they are content with their current standard of living. Perhaps that means younger adults are overestimating their chances of being short of money in old age but overall retirement satisfaction does appear to be trending lower in recent years. Indeed, the nearly three-quarters of surveyed retirees that said they are living comfortably is the lowest such reading from Gallup since 2012, and a recent Nationwide poll revealed that more than one in four retirees say that their current lifestyle is actually worse than before they left the workforce. A longitudinal study from the Employee Benefit Research Institute (EBRI) also found evidence that fewer Americans are enjoying retirement. Specifically, the researchers looked at retirees’ self-reported retirement satisfaction over a 15-year period (1998-2012), and found that the share of “very satisfied” retirees has been declining. 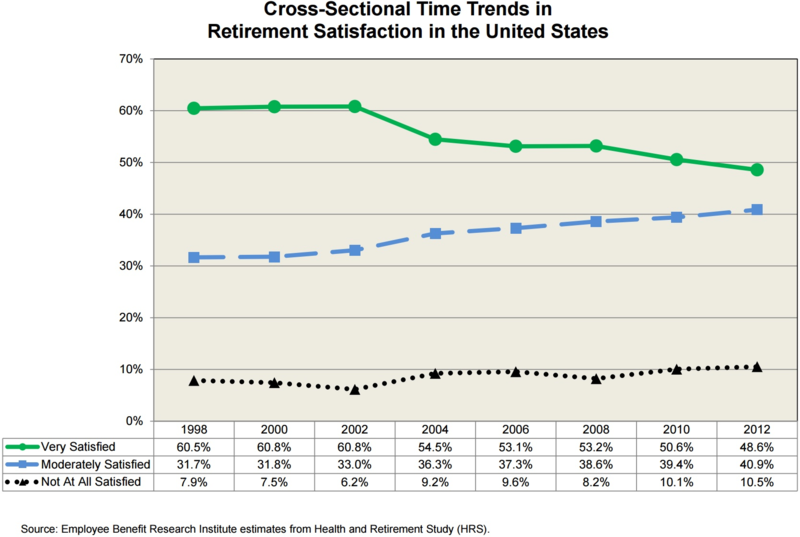 At the same time, the shares of “moderately” and “not at all” satisfied retirees have been increasing, and such trends could be seen across all economic groups. The researchers did not try to put forth an explanation for why the share of “very satisfied” retirees has been dropping but for younger adults such statistics should provide even more motivation for them to save as much money as possible for retirement. The sooner they can start the better, and taking full-advantage of employer-provided 401(k) plans and matching contributions can greatly enhance their chances of achieving old-age financial security.